Liquid nitrogen overclocking is a tricky business, and it requires the hardware you're overclocking to be properly prepared. Teams will typically get the soldering irons out to volt-mod their graphics cards, unlocking significantly higher voltages and allowing for much higher clock speeds. 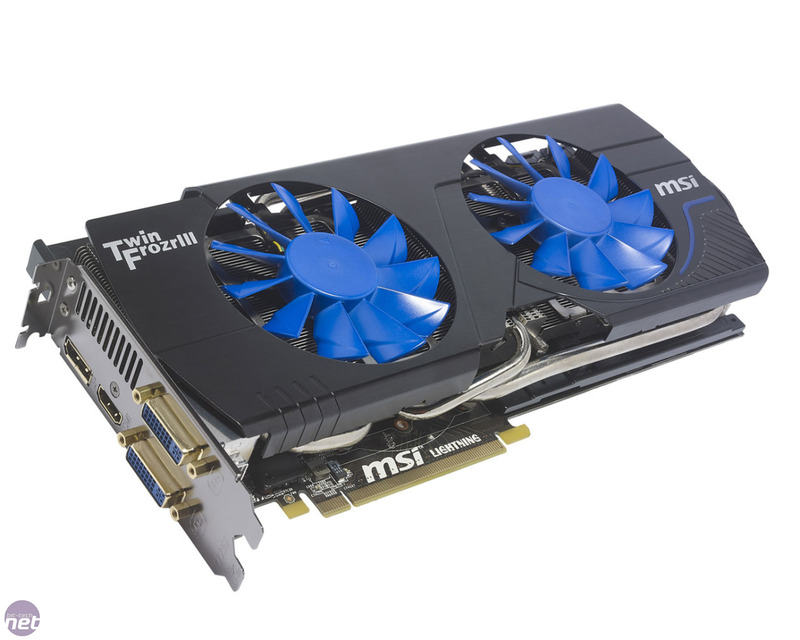 Rather than have overclockers mess up its cards with solder, though, MSI has instead decided to release a very special GeForce GTX 580 1.5GB card. The N580GTX Lightning Xtreme Edition is much more than your typical custom-cooled and factory-overclocked card; it comes with many of the voltage modifications that extreme overclockers use, ready to go. It also offers massively upgraded VRMs to handle the extra power required for massive overclocks, and double the usual amount of GDDR5 memory. Needless to say, the card uses a custom PCB to house all this technical finery, and with the addition of MSI’s Twin Frozr III cooler, the card measures 295mm (11.5in) long. Impressively, though, MSI’s imposing cooler still only occupies two expansion slots, although you’d be wise to leave a decent gap between a pair of these of these cards if you're using SLI, or if you plan to deploy a huge overclock to a single card. The Twin Frozr III cooler is composed of a bank of densely packed aluminium fins, which are arranged laterally along the length of the card. Through these fins run five (yes, five) nickel-coated copper heatpipes. Two are 8mm in diameter, while the central three have a thinner 6mm diameter. After emerging from the GPU contact plate, the heatpipes bend back on themselves before running through the fins at various points along its length to ensure an even distribution of heat. Despite its size, the cooler is only attached by four screws, so it's easy to detach in favour of an LN2 pot. 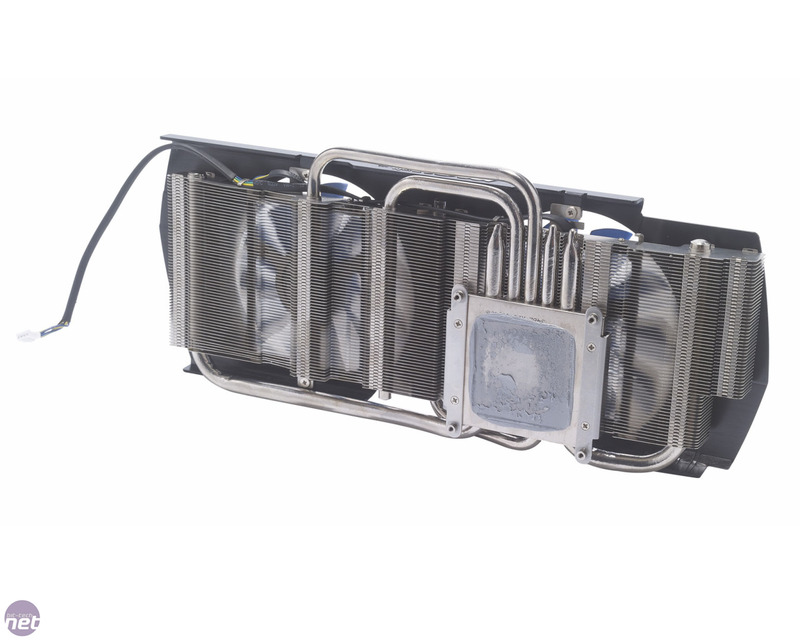 The card’s memory and power delivery circuitry are cooled separately by a black aluminium contact plate, which benefits from the down-draft airflow from the two 90mm fans. The PCB itself is loaded with enhanced voltage controls and power circuitry. In the place of the reference GTX 580 1.5GB’s 8+1 power phases (six for GPU, two for memory and the +1 for the board), the Lightning XE boasts an incredible 16+1 phases of power. The GPU uses 12 of these, while the memory has three phases; there's a separate phase for the PLL/VDDCI power. 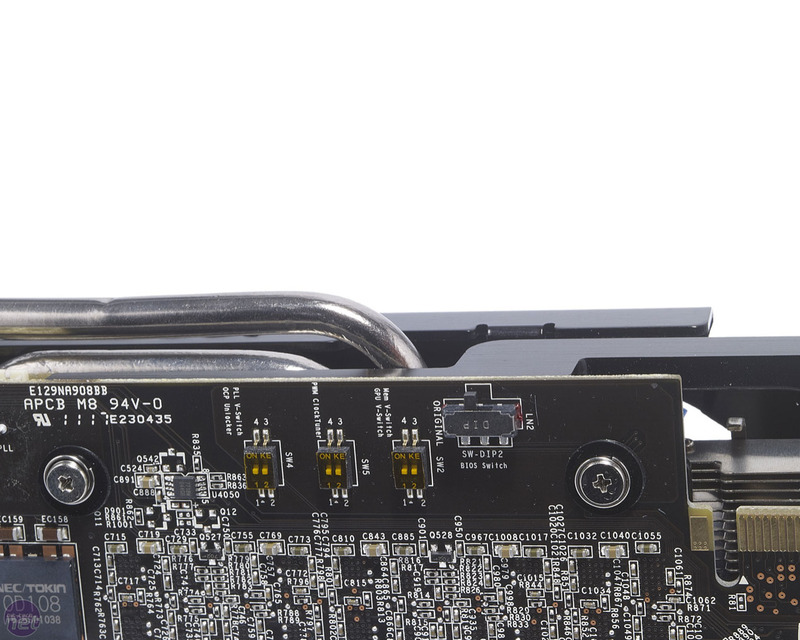 The 12 GPU power phases are linked to a bank of load-level LEDs on the rear of the card, adding a nice lighting effect when fitted into a system. There’s also a set of four NEC Tokin proadlizers on the card’s rear, replacing some of the traditional solid capacitors. Feeding all this power circuitry are two 8-pin PCI-E power connectors, mounted on the side of the card. This is also where you’ll find three voltage readout points for those handy with a multimeter. On the back of the card you’ll find three sealed switches (you need to unpeel the tape to use them) that unlock voltage options, allowing you to push levels of power through the card that would be unsafe with air-cooling. Next to these is a BIOS switch, which activates a secondary cold-bug-proof BIOS especially for LN2 overclocking. MSI told us that all of these switches are only for use with LN2 cooling, and should not be used unless you have an ample supply of the cold stuff on tap. could break it unless you really are using extreme cooling. Despite being LN2-ready, we doubt many people that buy this card will feel the need to grab some LN2 and void the card’s warranty. Happily, the card does ship with a factory overclock applied and offers a GPU core clock of 832MHz and a memory frequency of 4,200MHz (effective). These are improvements of 8 per cent and 3 per cent respectively, but are hardly earth-shaking improvements. The final addition that MSI has made to the Lightning XE is a doubling of the card’s 1.5GB of GDDR5 memory. As the GF110 GPU can only address a limited number of GDDR5 modules, this has been accomplished by doubling the DRAM module density, with 12 Hynix 256MB modules surrounding the GPU. In the past, we’ve found that cards with significantly increased amounts of memory offer little extra performance below ultra-high resolutions, so we were keen to see if this remained the case with the Lightning XE.